fluffnflowers: It's been a good day. Today has been a good day. What's so good? Well, it rained for the first time in 26 days today! Hurrah! Things were starting to get thirsty and the half inch we got today will definitely help out. Other than that, it's been a plastic wonderland. 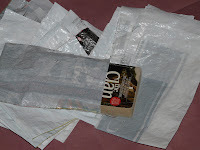 I made about twenty envelopes from old potting soil bags yesterday, and six clear ones from s crap 6 MIL plastic. I listed the six 6 MIL ones and plan on listing a set of ten of the potting soil mailers today. I couldn't bear to part with all of them, so half of the potting soil bag envies are MINE! :D I got an order for a book off of paperbackswap, so it got packaged up in one of these and is out in the mail. I hope the person receiving it reuses it!